Have you finished your Christmas shopping yet? Stuck for ideas? 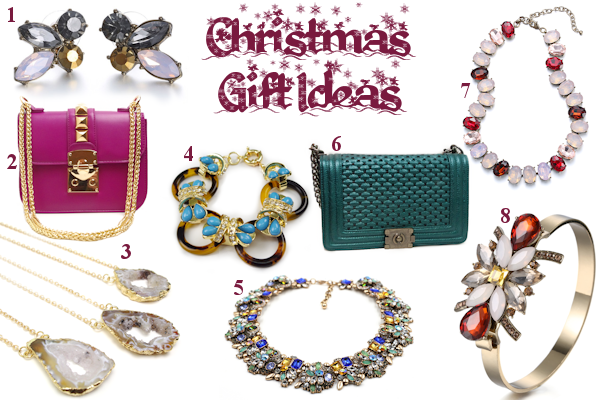 No need to panic, we've compiled a selection of items that we would love to find under our tree! Unwrapping any of these beauties would be sure to fill anyone's Christmas morning with joy! Order by Saturday 19th December for Christmas Delivery. We hope you all have a very Merry Christmas & a Happy New Year! Clockwise from top left: The Lauren, The Jane, The Deb, The Rachael & The Sarah. If you're a regular to our New Arrivals page, you might have noticed something very special over this last week. Something we've had up our sleeves for a while now.. A Midnight Wonderland has launched our very first handbag collection! We couldn't be more excited to unveil these first five beauties to the World! We've worked tirelessly to ensure that they are all of the highest quality. So luxurious to the touch and built to see you through every season in style. With prices from £22 to £36, they've got the high end look with a high street price tag. We just can't get enough of them! We hope you like them! Which one is your favourite? Tonight is a pretty exciting night in TV land.. unless you've been living under a rock, you'll know that tonight is all about the Pretty Little Liars summer finale.. and you know what that means? We finally get to find out who A is! Not only is Pretty Little Liars a firm favourite show of ours for the drama and plot twists, but thanks to costume designer and stylist Mandi Line, PLL is totally nailing it in the style stakes. Every week we tune in to see what the Liars are wearing next and to get inspiration on what trends we should bring to A Midnight Wonderland. In honour of this momentous occasion (seriously, we are SO excited, we can't even contain ourselves), we've rounded up some of our favourite Aria & Hanna style moments and show you how you can effortlessly and affordably emulate their PLL style! Laurie Keller, played by Busy Philipps in episode 6x06 of Cougar Town. Here at A Midnight Wonderland we're massive fans of the TV show Cougar Town. We love it so much that it can often be found playing on repeat in the office during the working day! Why can't we be part of the Cul-de-Sac crew? Imagine our delight to tune in to one of the latest episodes to see a very familiar jewel sparkling around Laurie's neck! Doesn't she look fantastic? You can steal her style and channel your inner Laurie with the Pretty Petals necklace which is available online at AMidnightWonderland.com and priced at £19. It's finally that time of year when we can throw on a hat and scarf and bundle up in all those lovely extra layers. This month has seen the arrival of a whole bunch of new scarves and hats in the store and we're completely obsessed with them all! Have you noticed the little heart cut out detail on the tan hat? It's such a fun addition and really adds a little something extra to it! The embroidered sleeve jumper is the perfect addition to anyone's winter wardrobe, it's so easy to dress up or down and it's the cosiest thing ever. Seriously, I wish you could reach through the screen and feel it.. it's SO soft! As for jewellery, we are getting seriously excited to layer our statement necklaces over big fluffy jumpers and party dresses alike. This month the Upper East Side necklace is our absolute fave with its beautiful gold, green and blue tones it's the perfect opulent autumnal piece. For something equally beautiful, but slightly more simplistic the Fluorite Amulet is our pick. How pretty are the layered colours? 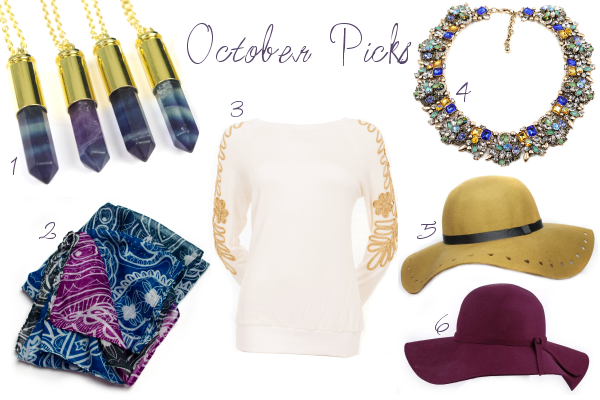 What are your must have pieces for October? This month it's all about transitional pieces that will take us from the tail end of Summer into the throes of Autumn/Winter. The sun is still (occasionally) shining and it's not quite cold enough to dig out the woolly tights and thick layers yet, but the allure of Fall fashion is already drawing us in. We're fully ready to embrace a darker colour palette and a slick of deep berry coloured lipstick. 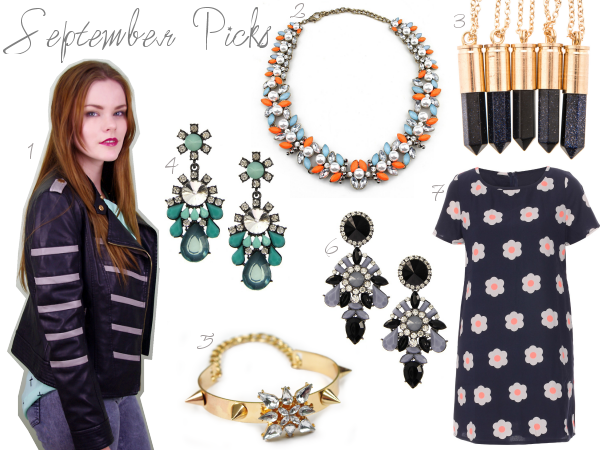 What are your must have pieces for September?